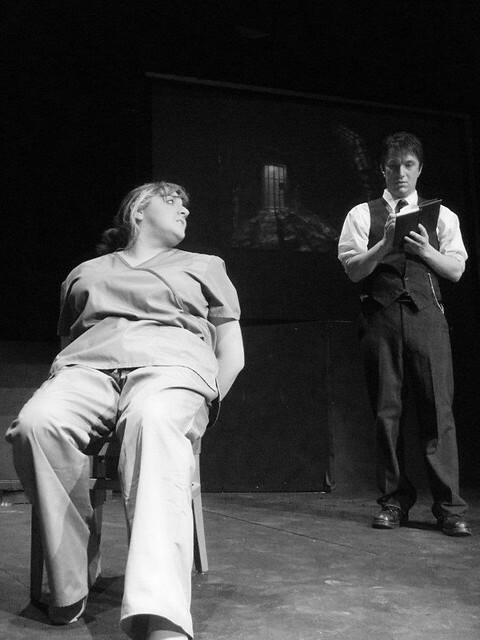 For its last production of the 2011-2012 LVC season, The Wig and Buckle Theater Company completes its year-long exploration of the concept of "Theatricality" with a work by one of the world's greatest contemporary playwrights, Caryl Churchill: the forceful and disturbing 1976 drama Vinegar Tom. This season began with a lighthearted romp in the world of metatheatre—plays about the theater itself and its cultural role—with the comedy Wild Oats. The company then considered the idea of theatricality as a metaphor for human corruptibility, greed, and passion through the hit musical Chicago. Now, with Ms. Churchill's starkly episodic play about accusations of witchcraft in a small English village, the company concludes its season-long learning with a play whose structure alternates acted scenes with choral commentary separate from but emotionally reactive to the plight of its characters—a technique as old as ancient Greek tragedies and as new as the epic theater style of 20th century expressionistic political theater. This kind of technique, which interrupts the action and reminds audiences that we are sitting in a playhouse watching a play, is known as theatricalism, and Caryl Churchill has made a career out of using it to shake audiences into an uneasy awareness of agonies and injustices which our comfortable assumptions about art's role in society and our complacency about our own position in social systems have led us to ignore or accept. Vinegar Tom is a product of the turbulent 1970s in the United Kingdom, where anger over economic inequalities, industrial decay, and spreading dissatisfaction with a failing social welfare state were leading to unrest and political paralysis. In the midst of a threatening class war between the "haves" and the "have nots" of British society, a number of politically active and socially sensitive new theatre companies came into being across the nation; these companies, particularly the now famous Joint Stock Theatre Company operating in Edinburgh and London, and a wonderfully daring feminist outfit known as Monstrous Regiment, led the charge into subject areas where conventional commercial producers feared to tread. In 1976 Caryl Churchill was just rising to critical attention in the U.K. as the author of quirky postmodern works that questioned established thinking in politics and in art, so it came as no surprise when she was almost simultaneously offered commissions to write plays for both Joint Stock and Monstrous Regiment. Curiously enough, both companies were looking back at English history for subject matter around which it might be possible to shape works which could acidly comment on the state of postmodern Britain, and independently of each other both companies hit on the mid 1600s (the period of the English civil wars and the last great British witch hunts) as a period with uncanny parallels to the country's current difficulties. Churchill, who up to 1976 had worked as a traditionally solo playwright, agreed to develop both plays in collaboration with the actors of both Joint Stock and Monstrous Regiment; delighted with the experience, she devised Light Shining in Buckinghamshire for Joint Stock and Vinegar Tom for Monstrous Regiment between Easter and October of 1976, using overlapping historical research to help speed the process. Vinegar Tom opened at the Humberside Theatre in Hull on England's east coast in October 1976. Monstrous Regiment (whose name as a feminist theatre company was ironically lifted from a 16th century pamphlet attacking the "unnatural rule" of female rulers such as Katherine De Medici, Mary Queen of Scots, and Elizabeth I of England) scored a noteworthy success with the work, which showed how the entrapment of both sexes in rigid roles of religion, class, and gender unleashed destructive forces against marginalized women whose lack of political and economic power made them ideal scapegoats on which their "betters" could blame their own woes. Besides being a time of conflict between an authoritarian King and Church on the one hand and Parliament and Puritanism on the other, the mid 1600s in England were seeing an emerging struggle between old folklore and new medicine, in which a tradition of herbal cures and midwifery by so-called "cunning women" in local villages was being suppressed by a male-dominated medical "profession" promoting allegedly rational theories about imbalances in the body's fluids or "humours." Churchill herself said of the play that "I wanted to write a play about witches with no witches in it; a play not about evil, hysteria, and possession by the devil but about poverty, humiliation and prejudice, and how the women accused of witchcraft saw themselves." In the original production, the scenes of the witchcraft plot were done in historical 17th century dress and the commentary songs were done in modern dress; in her debut production as a director for Wig & Buckle, Jenna Dutton has made the bold choice to do the main plot scenes in contemporary clothing, suggesting that the play's theme of marginalization of women remains a universal concern. 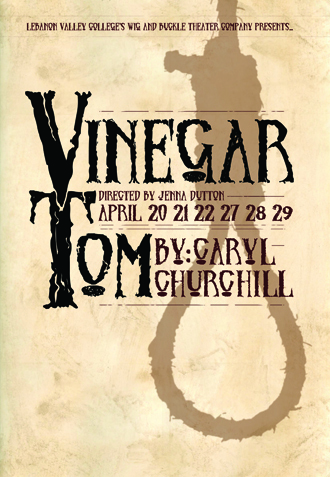 In a sociopolitical landscape 36 years and an ocean removed from the unrest of pre-Thatcherite Britain which gave birth to Caryl Churchill's play and 370 years after the events which provide Vinegar Tom's historical setting, Jenna's artistic choice may have great resonance. Throughout the nation in which we live, furious debates divide us; we fight over whether the poor have any rights the rich are bound to respect, whether women should have the right to reproductive freedom regardless of their economic status, whether there's only one acceptable definition for "family" or "marriage," whether one set of religious or moral convictions qualifies or disqualifies a person for office, and whether we should keep the nonconforming "others"—the homeless, the aliens, and the minorities among us—out of our neighborhoods with police stops for identification, with gated communities and self-appointed vigilantes. Those among us most fearful of losing their little share of the American Dream or their large share of political or economic power seem most ready to go witch hunting, to find some conveniently powerless scapegoat to blame for all their troubles; as long as we behave like this, Caryl Churchill's witchless witchcraft play will have the power to enchant us into recognizing the agonies and injustices inflicted by our unwillingness to see that we are all part of the problem. Enjoy the show, listen—and learn something.